Rx Biosciences offers yeast display library construction and screening service. Yeast display or YD (or yeast surface display or YDP) is a technique widely used to express the proteins at the yeast surface after translation and maturation in a eukaryotic system. Therefore, the yeast display has advantage over phage display for display of protein or antibody because the eukaryotic expression environment of yeast cells allows fine tuning such as folding, modification and translocation prior to display on the surface. Libraries of human antibodies displayed on the surface of yeast are screened using flow cytometry. Therefore, the yeast displayed antibodies are conformationally and functionally closer to their human native counterparts. Rx Biosciences uses yeast display system for the monitoring of the antibody maturation. 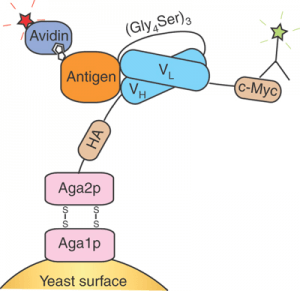 An antibody expressed at the surface is allowed to bind to the antigen at increasing stringency and antigen-binding yeast cell population is sorted out using Fluorescence Assisted Cell Sorting (FACS). The antibody is then purified over an affinity column. .
Rx Biosciences has 10+ years of the experience of the field and developed a unique transformation protocol that guarantees up to 2×108 transformants per ug of ligation mixture, enabling production of highly efficient libraries of high diversity, making it a tool ideal for high-affinity antibody discovery and affinity maturation. scFv yeast display antibody libraries are created by combining a highly diverse collection of synthetically-constructed randomized CDR sequences of diverse lengths. Codon randomization protocols result in minimum occurrence of stop codons providing additional value to the library.